Mauranun an mga nakaagi na adlaw kay dahil sa Bagyong Usman. Pero kadamo pa man gihapun san mga tawo sa dalan! Mauranun bago magbagong taon. Along Magsaysay Street ini san December 31. An Graceland damu pa man gihapun an kustumer maski mauranun. Siguro dahil damo naman an may kotse, kaya madali na lang magruluwas an pamilya maski mauranun. Nagdaku ako na pag may bagyo o mauranun, sa balay lang hanggang mag init. Bagan niyan, maski nano an panahon, nasa luwas pa man gihapun. Mabakal ako sin gaza nan bulong sa sipon nan kulog sin ulo. Mauranun sa luwas, basa na an shorts ko nan likod ko! Pero nakabakal naman ako sin kape sa plasa. Ginhahanap ko an lola ko kay may tindahan sinda, kundi sarado niyan. An batit ko, ginpaupod ko nagbayad sin amilyar para makaaram man. Nakaisturya siya sin Sorsoganon, kundi minsan dili nakadumdum kun hain siya. Nagbrown out, pero buminalik man gihapun.. Nag abut kami san Sorsogon City around 4pm, 2 days ago – mga 12.5hrs. Amo an pinakamakaskas na biyahe ko since 25 years ago! Dili ko aram kun dahil sa Quezon Eco Tourism Road an agi namun o wara masyadong sasakyan sa dalan. Wara man gihapun pahuway kay lantuag man tulos pakadto sa Rompeolas. Naghuhulat kami san pagkaun namun. Niyan ko lang nakita na punuonun an Bigg’s. As usual, I ordered the ribs. Well, it’s been a while really. We made it to Pili in 8.5 hrs! Dili ko na madumduman kun san-o an urhi ko na biyahe na wara pa siyam na oras an pa Pili. Dili kami nag agi sa Lucena, via Batangas (San Juan/Ibaan) kami tapos luwas namun sa Quezon Eco Tourism Road. Lucena na an luwas namun. Excited na kami san asawa ko maghapit sa Bigg’s. Bagan dili kumpleto an biyahe pag dili nag agi – kaupod siya sa orasyun San pagbiyahe. We are packing today for our trip to Sorsogon after Christmas. But before that, we have to drop by Paranaque for Christmas Eve and my parents’ wedding anniversary. Packing for a road trip can be stressful, especially if you want to squeeze stuff in every cubic inch of the car. But I am just looking forward on our safe trip to Bicol. Unfortunately I cannot bring our bikes with us; I was hoping to explore the Bacon-Manito road. Perhaps I will just bring the car and see where the road leads to. Maogmang Pasko sa Indo Intiru! I was able to spend a couple of hours researching historical records of Sorsogon back in the American occupation. I could only do this if I am in the US since only IP addresses from the said country could access the necessary materials. I was able to get hold of a picture from University of Michigan, the eBook from Google on the Philippine Commission reports to the Secretary of War, etc. The search results seemed to be different compared to when I am in the Philippines. So far, I have written 3 articles in the next several weeks – of course, all historical articles from tonight. I hope I can get more before end of the year. For the first time, I almost forgot about this blog (dati pano dili ko lang nagigibo). Juggling my new role and the responsibilites at home is becoming more difficult. If it’s any consolation, I found some pictures about our trip to Donsol, Jovellar, Sorsogon Bay and Bulusan. All taken around 2-3 years ago. Apparently it stayed on my camera and only realized it when the SD card was already full. And just now, we decided not to have the baptism of our second daughter in Sorsogon. I guess I don’t know when’s the next time I am going home. I have been contemplating if it’s time to purchase a domain name for this blog. The domain will reflect its topic and objectives. It’s been 8 years since I started the blog and around 7 or 8 years since I moved the blog to WordPress. I actually have 2 options – simply purchase a domain name separately and map it to my blog, or upgrade my free plan to a paid one, which a domain name is already included. The latter offers more than a domain name, it offers SEO, and depending on what type of plan, it can monetize the site – attractive, but not part of what I am thinking for the blog. Furthermore, because of my job, I fear that I may end up with just the expenses without the benefits of the paid plan. Something to think about…. The last presidential election was a devisive one, even my daughter entered the conversation. I am one of those called dilawan (just because there’s no other better choice) and my wife was (yes, was) DDS; and my daughter – she was more of a sponge and tried to understand her parents’ different opinion. If there’s a silver lining here, my daughter learned what real leadership means, especially lately, and my wife and I stopped talking about politics after the killings went into Energizer frenzy and the revolving door policy on the corrupt friends of you-know-who. In any case, you can’t simply do away with politics because it affects us every day. And lately, the talk of the town is federalism. At least, from what I understood, DDS and co is pushing such form of government so that the regions will be more financially independent and not beholden from the Imerial Manila. And this is what I found in Business World article. Chart is courtesy of Business World Online. 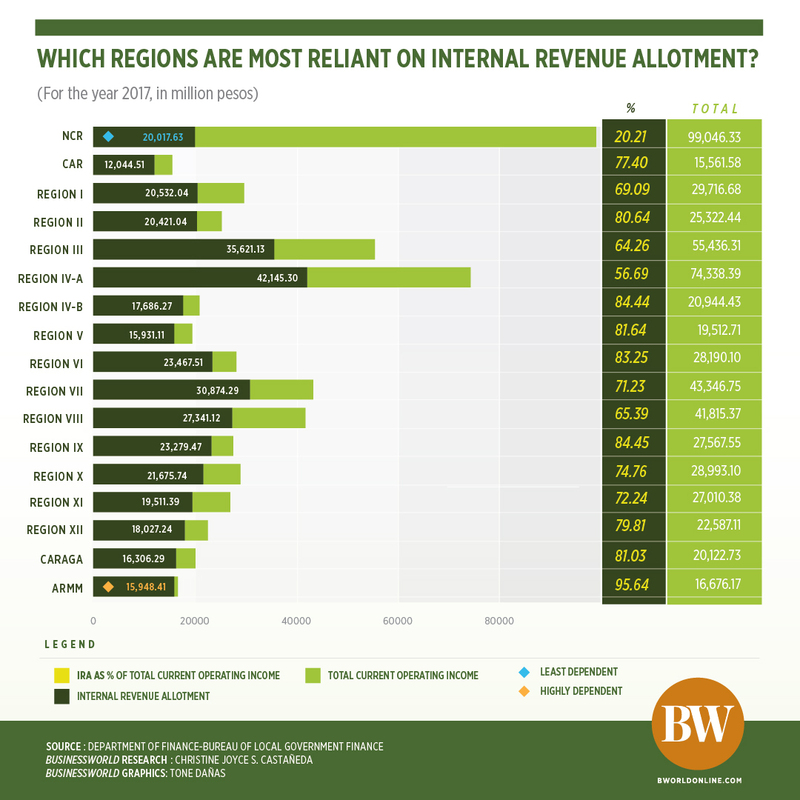 From this chart, Bicol region is almost last among the pack, not necessarily the one with the least potential. Thus, if federalism becomes a reality, the said region doesn’t have enough punch to support itself unlike other regions. Of course, there’s more to it than this, but the chart does make you think of our future once we switch to federalism. From time to time, I would check in the internet if there’re articles related to our beloved hometown (still working on letting go). And recently, I encountered the name Melecio Figueroa. I do remember that last name back in my schoold days, but can’t pinpoint if he’s a schoolmate or a teacher. In any case, beyond that, it doesn’t ring a bell until the article. Apparently, he was an orphan and ended up in Sorsogon until he reached 16 years old when the Ayuntamiento chose him to be a scholar in Spain. Later on, he was taken as the Prince of Filipino Engravers. Upon checking these articles, he’s also related to an aunt named Juana Yulo. I wonder if he still has living relatives in Sorsogon. And are there other successful Filipinos in the past that had roots in Sorsogon and we don’t know about. Time will tell. I decided not to create an article about him since there’s very few to go on about his childhood days in Sorsogon. I am waiting at a coffee shop for my turn on passport renewal. Due to the lack of capacity of the DFA to handle the large requests, I ended up asking for assistance from Ako Bikol’s Congressman Garbin Jr. I found out later than even senators would give such assistance to their constituents. Thus, I am here in a coffee shop waiting for my turn. In the last several days, there’s so much memorable experiences – the best is I became a father again last Saturday. It wasn’t an easy pregnancy for my wife, but she pulled it off with the assistance of great docs. It’s been 10 years since our first born, so we had to wipe the dirt from the baby manual. It’s a fulfilling week so far, despite of staying in night shift. I am excited to see her grow speaking in Bisakol. My daughter and I are now discussing where the baptism will be – this is to ensure that she doesn’t feel jealous. You see, my daughter was baptized in the parish of Brgy. San Roque, Bacon (yes, I just couldn’t let go of the former town). And the post-baptism lunch was in a bar (now closed) along Calle Nueva St. I was testing my daughter what her preference is. I asked her if it’s okay to have her baptized in Brgy. Poblacion, Bacon or in current address. Both she doesn’t like – she prefers fairness. Even when I offered post-baptismal lunch/dinner in McDonald’s, she also doesn’t like. The truth is, we don’t where we are going to have my 2nd daughter’s baptismal. My dad proposed to have baptismal lunch in the seafood restaurant near Bacon’s publc market – but both myself and my wife rejected it immediately because it’s the seafood restaurant that doesn’t have seafood to serve. Meanwhile, we got a kasambahay from Zamboanga – I asked her to talk to my eldest in Bisaya. Let’s see how it goes. Another important event is I found out that my former classmate in grade 5, who I thought died on 1985 from Sisang, is alive! Apparently, he was swept by the waves (his family lived in Rompeolas), but survived. Unfortunately, he had a trauma and couldn’t remember any childhood memories – including his relatives that I grew up with in Brgy. Bibincahan. But I am quite happy to know that he’s now a teacher and doing his doctorate. Actually, the whole batch in SPES was quite happy to find out. We really thought he was dead because the community along the bay was wiped out and he never showed up, until now – in FB! Another event, which is unfortunate, is I lost my Samsung Note 8. The reason why I loved it is due to its camera and memory capacity. It’s kind of my mini-office and I use it a lot in editing or creating blog articles (now you know why there’s so many typo in this blog). I even use it for editing pictures for the blog. Tonight, I decided to clean up my blog especially the inventory of images. I am barely scratching the surface. Though I was able to add a couple of articles that should’ve been published earlier. Thus, I am putting the month/year when the pictures were taken as reference. Hopefully the additional description will provide clearer context to our dear readers. As usual, I am stuck again with office works. I still have tons of pix that I could share during our past trips to Sorsogon. I haven’t really talked to my Sorsogon-based friends yet how the summer is. My mom did mention that it rains a lot! We also missed our 25th anniversary in SNHS. We are the host this year. I saw some of the pictures, we just wanted to fly home. Right now, trip to Sorsogon this year is almost impossible with my wife expecting our child on July. It’s interesting because my eldest wants her sister to have the baptismal where she had hers. We didn’t want the mass baptismal so we looked for a priest – we found one and has my edlest’s baptismal in Brgy. San Roque! And the family and relatives had lunch in the old Pam’s along Calle Nueva. We are planning to have the baptismal in Sorsogon, but anything can happen. I am now back in Manila. My in-law is still in the hospital but getting better. The flight yesterday was delayed by 30m due to congestion in nAIA. Not bad really. The best part of the flight was the captain who turned out to be our friend. My wife and I were discussing the possibility of having him pilot the plane, and this is not our first (We met our SNHS classmate on our way to Cebu); and she noticed the voice over the PA while we were onboard. He was also surprised to see us. This is the second time in UNA Pizza during my this trip. Last time we had pizza, Grape slush, fish n’ chips. Tonight we are having Porchetta (2 slices), Tres pizza. I’d like to know if the Porchetta here is better than Splendido De Rompoelas (which i find to have the best sisig, Porchetta). I saw this coffee shop, Coffee Cat, last night on our way home. And after taking care of bank transactions, I decided to check it out. I had blueberry cheesecake and cappuccino. I stayed outside and enjoy the view of Magsaysay street. Unfortunately I have to cut my me time short since I need to pickup my wife. Due to a family emergency, my wife and I decided to fly to our beloved hometown with just a 24hr notice. This is a different visit because there’s no plan for me to get some pictures foe the blog. But i just couldn’t help it. Just tonight for dinner, I had a chance to take a picture of the Rompeolas signage. I had a chance to take a pictures of Legazpi Domestic Airport as well, before it will be replaced by a bigger airport south of the current airport. And I am sure I will have more opportunities to plan for additional articles. The author wants to test if the Samsung Note can take a high quality picture with normal setting during night time. The author, when this picture is taken, is approx. 300m away. Out of this visit, I might come up with another article under Orosipon series. This time, it’s about the Sorsogon Provincial Hospital and the Baywalk. While having a cup of coffee, I decided to check the wiki of Sorsogon City. I was surprised how it improved – both on the way it was written and the quality of content as well. I haven’t really checked yet who did it, but doesn’t matter as long as it helps the wiki article. Author’s daughter pounding hinagum just today, 02112018. We went to visit my lola and my parents. Apparently they were planning to have hinagum for afternoon snack. By coincidence, earlier I was composing an article about it. It was funny because I have pictures of my kid pounding the hinagum ingredients on two occasions. This must be a good sign – it’s only February and I am composing my 2018 journal. For 2017, it was pathetic – one journal entry only and it was in August! It’s already February and summer holidays is just around the corner, so I have started collecting related articles from the net and scheduling it around March. One article from Inquirer covers Barcelona, Bulusan, Gubat, Irosin, and Juban – I modified it by adding my own collection taken during our Sorsogon road trip on 2013 (if I compose my own, it might take another 5 years!). And normally, during this period, the blog gets high number of hits especially on the articles about driving to Sorsogon. I also have tons of pictures on my broken mobile phone. I would need a day to figure out how to move it to the cloud. Lately, I am getting inquiries about LGU information, e.g. contact information, location of the LGU office and the likes. I did try to collect such information two years ago – but I lost my notes. The first initiative regarding this matter was about farming and went to 3 different offices. If any one can help me out on those information, salamatunon tabi! My last visit to Sorsogon was Undas 2017. We only stayed only for 4 days and we took the bus, thus, I was confined only in the city. I know I took some pictures but they are stuck on my broken phone. Unfortunately, we are expecting a second baby that we may not be able to travel to our beloved town (I know, I still can’t let go of old memories!) this year. Honestly, it’s difficult to maintain the blog, plus I have another blog about our local community in Rizal which gets updated more often than this; even copying related articles from the news sites is still challenging. And my wife is encouraging (nagging?) me to review all of my articles for typo and grammatical errors. Admittedly, she’s the better writer compared to me. The only reason that gets me going are the readers who would leave encouraging messages, and the likes of Tina who would share some of her own articles about Sorsogon City. Dios mabalos tabi sa indo intiru!